As I realized, in the middle of this month, that I still hadn’t emptied my blessing jar from 2015; I sat and began to look at every single piece of paper that had significant moments in my life. Although I’d known, there was a feeling that began to overwhelm me. Recording and keeping this jar is so important and beneficial to your growth as an individual. It not only causes you to sit for a moment and be thankful as you’re writing them down. But when it comes time to read those moments, it helps you to remember those very moments. It’s important that we record moments that we’re most proud of; our accomplishments, achievements, special moments, moments of joy, etc. There are several reasons why we need to write out important moments in our lives. We’re our biggest critics, and we don’t always feel like we’re doing enough. I’ve experienced this, as I’m sure many of you have. We feel like there’s so much more for us to do, and we don’t even realize that what we are currently doing is very significant. As we set time aside at the end of each day and really reflect, then write on little slips of paper these very moments we realize how much we are actually doing. It shows us what we are capable of, and it also increases our faith. It also shows us what and who we’ve placed ourselves around, and how it’s helped change our lives. Seeing our accomplishments on paper shows us how we are able to make a difference, and the steps that we’re making to make an impact. After doing this for a complete year, when you go back and read every piece of paper, it puts you back into those moments. Sometimes going through an entire year, we can forget some positive things. I can admit, sometimes the negative moments come and almost makes you forget some of your biggest moments. Those moments where you’ve made some of the most progress. There are times we stress over completing big tasks or projects, that we forget the small moments that led us to where we are today. This has been a personal experience of mine. We go from one thing to the next, forgetting to recognize and celebrate significant moments in our lives. There are also times when we need to reassure ourselves that we can go to the next level. From my personal experiences, reading every single slip in my blessing jar; I saw plenty of small and big moments. Ranging from coworkers coming to church with me, to connections I made. Meeting exciting people to attending several events. Reaching goals to overcoming my fears. Being transparent. Random, purposeful, meaningful relationships. To experiences moments that didn’t follow through. But instead of feeling bad about them, I saw how I was able to learn and grow, and what else God had in store for me. From my very first “speaking engagement”, being a facilitator at the NYC Collaborative Studies school with the Future Project. Seeing where I messed up. Most importantly, I was able to see the seeds that were planted, the watering is now taking place, and I can sense the blossom that will soon take place. As I read these slips of paper, I smiled, I was able to think back, and even teared up. The very first day of 2015, I tried mussels for the first time. I wrote that this signified the start of doing things I’ve never done before. That set the tone for the year. I stepped into things I’d never experienced before, or thought I’d ever have the courage to do. A blessing jar sets the tone for your year. It causes you to focus on growth and determination. In a fresh, new way. This is my third year doing this experiment. This experience. And it’s helped me to have more gratitude. It’s helped me to be thankful for every experience and moment in my life. It’s helped me to look at things differently. It’s also helped me to look at myself differently, well the way I was meant to see myself. If you haven’t, I encourage you to join this journey. This journey to a more gratified life. It will help you in more ways than one! This is absolutely beautiful! I am so glad you shared this. I just moved and was thinking of a way I can record what the Lord has done in a fresh/creative way. This is GREAT!!! Thank you so much! 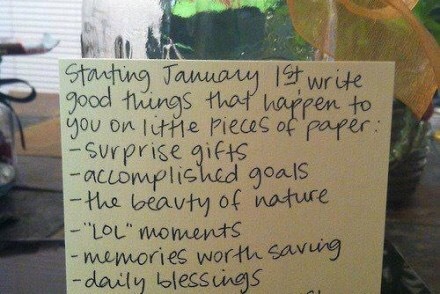 Yes, this would be a great way to record all of these wonderful blessings from God. All the best to you! Thank you again, appreciate it! !